Hamlet is in a bathtub with water up to his neck delivering “To be, or not to be.” Look to your right and you’ll see his mother, Gertrude, in her bedroom putting on makeup. Look in the distance, and you’ll see Laertes, practicing with his sword. And if you look to your left, you will see your own reflection in a gilded mirror. You will appear haggard, bloody, ferocious and, in fact, dead. Because in this virtual reality version of Shakespeare, you are the ghost of Hamlet’s murdered father. 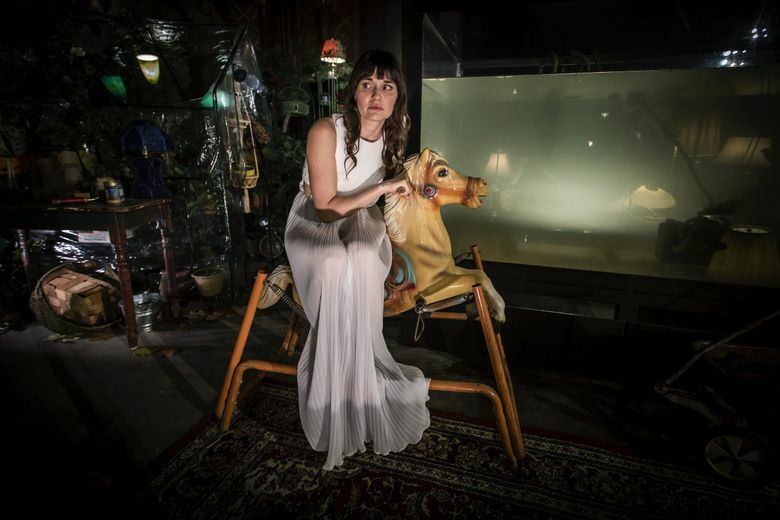 That version, “Hamlet 360: Thy Father’s Spirit,” is a joint production of two very different outfits: Commonwealth Shakespeare Company, which is known for staging free Shakespeare on Boston Common, and the tech giant Google. Its creators hope that beyond the fresh experience it provides, it will also serve as a tool to bring great theater to wider audiences — and bring bigger audiences to theater. Other theater productions have played with new and immersive technologies in recent years. 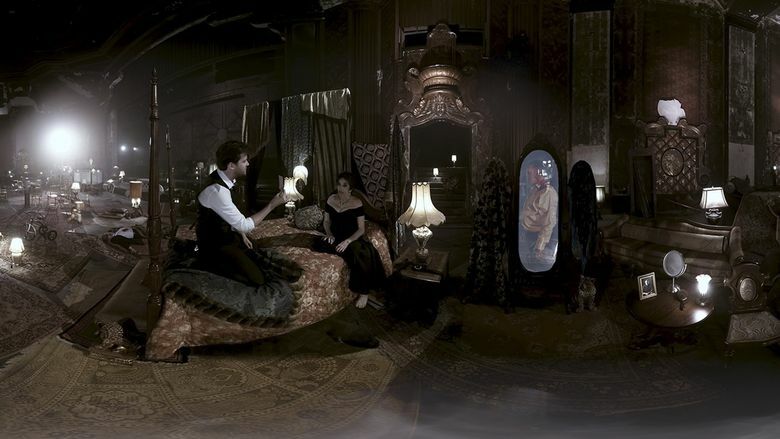 The National Theater in London and the National Film Board Canada produced “Draw Me Close: A Memoir,” which uses virtual reality and motion capture to bring the audience into a character’s memories. A one-man show called “The Encounter” handed out earphones and used sound in a way that was central to the storytelling — characters seemed suddenly to be right beside you. The Royal Shakespeare Company mounted a production of “The Tempest” that used motion capture to create an onstage digital avatar of the spirit Ariel. “Hamlet 360” was released Jan. 25 by WGBH, a PBS member station in Boston. It is being hosted on the station’s YouTube page, where it can be watched in 3-D using a VR headset or in two dimensions on a desktop or mobile device. The budget for the film was roughly similar to what the Commonwealth Shakespeare Company spends each year on its Boston Common productions, which is about $500,000. Maler declined to say how much was paid by Google. At just 61 minutes, this “Hamlet” is both extremely long by the standards of virtual reality and extremely short by the standards of “Hamlet.” Maler said that to mercilessly slice it down — while also creating a satisfying story — he laser-focused on Hamlet’s relationship with his father. The film plays out in a single location, at the center of a large, rundown hall with a stage to one side. 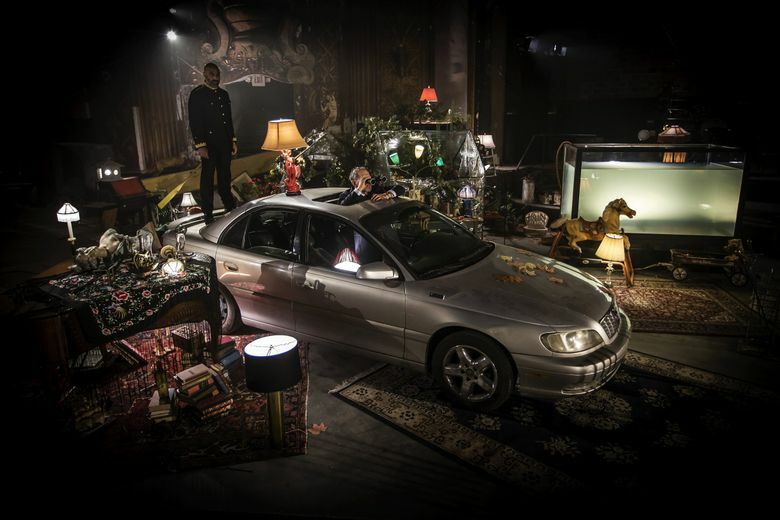 It is a cavernous room outfitted with lamps, a collection of shabby and ornate furniture, a patchwork of rugs and an old car. Actors move around the room, encouraging viewers to explore the space. Sometimes a sound that seems to come from over your shoulder is a prompt to turn around. 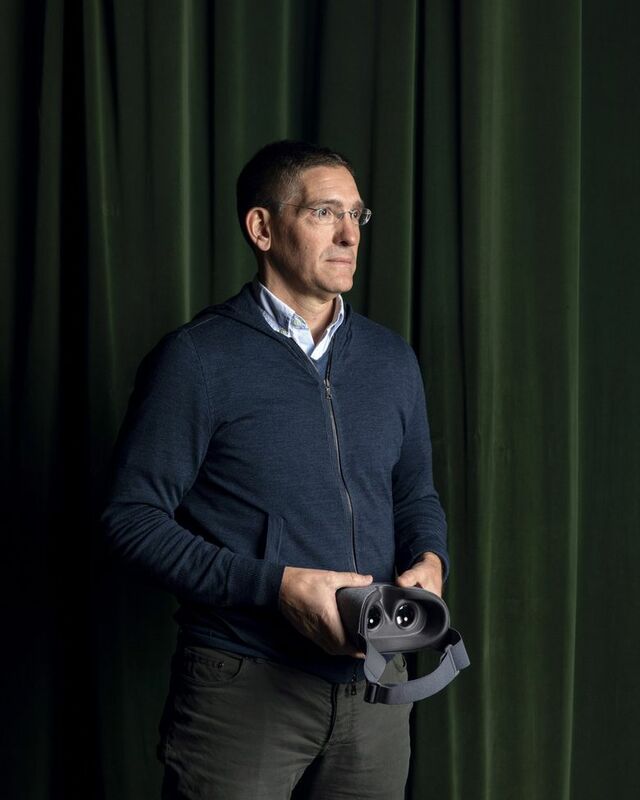 Matt Apfel, the director of augmented reality and virtual reality content at Google, said there was a “sizable void when it came to arts and culture and VR,” so when Maler, who does consulting for Google, pitched the idea, Apfel and his team were intrigued. The possibilities of using “Hamlet 360” as an educational tool were also exciting, Maler said. One of his central goals for the project was to bring this Hamlet into classrooms and schools, where performances of Shakespeare are common but professional-caliber productions are not. Although you watch it on a screen, “Hamlet 360” feels in many ways more like theater than cinema. The takes, for example, are extremely long — the “get thee to a nunnery” scene lasts nearly 10 minutes and is composed of only two shots. 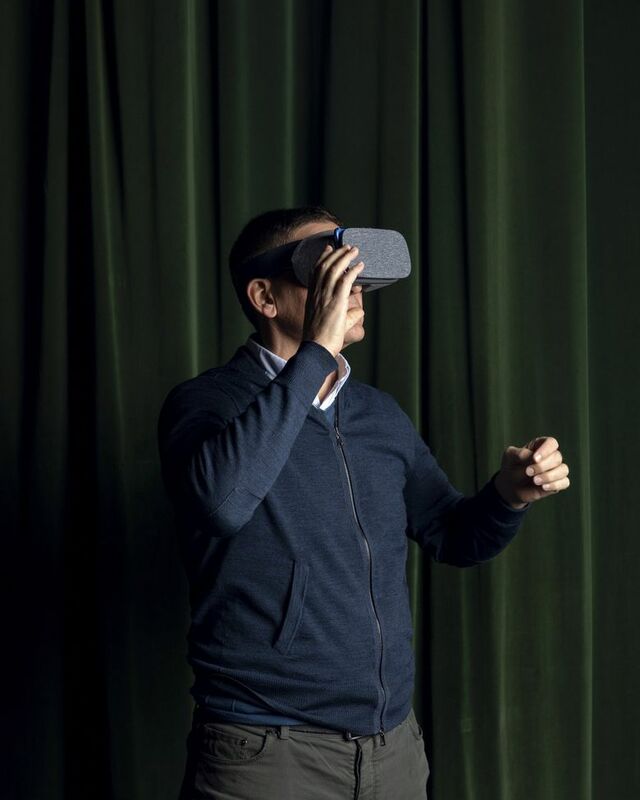 Matthew Niederhauser, a technical director and cinematographer on the project, said that quick takes can be hard to watch in VR because viewers have to reorient themselves every time the camera moves. To capture the action, a camera called the Yi Halo 360, lent by Google, was planted in one spot and the actors moved around it, aiming for the sweet spot of its focal depth, about 3 to 8 feet away. The Halo is made up of 17 cameras, one pointed up and the rest fanned around in the shape of a wreath. The resolution can be a little grainy, but the production was shot so that as viewing technology improves, this “Hamlet” will “keep up with the times,” Niederhauser said. With lenses pointed in every direction except down (there is a blind spot on the floor, obscured by whiffs of smoke used to signify the ghost’s presence), crew members couldn’t just shuffle behind the camera when action was called. There was a black wall in the back of the hall where most of the crew would stand. The sound engineer sometimes hid behind pieces of scenery, like a big sofa or a car. Quirky technical requirements also created unusual challenges for the actors. Maler said he intentionally cast a group with stage and camera experience, including Jay O. Sanders in the role of Hamlet’s father, Brooke Adams as Queen Gertrude, and Faran Tahir as King Claudius. 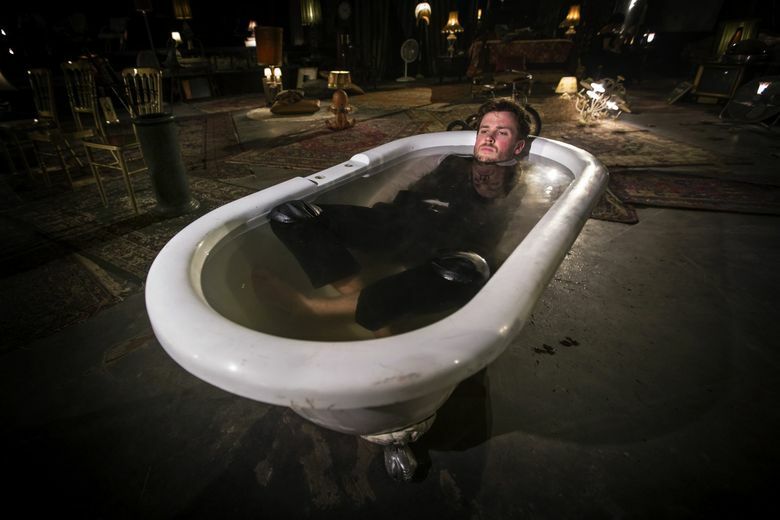 “I don’t want to make it sound harder than it was, but it kind of had the hardest parts of both,” said Jack Cutmore-Scott, the actor who plays Hamlet, referring to the camera and stage work. Cutmore-Scott said that seeing his own performance in 3D was also a somewhat different experience. Indeed, being right there in the room is what gives this project so much potential, Maler said, because it changes the experience of a story that has been told for 400 years. During the play-within-the-play, when Gertrude and Claudius watch as the murder of Hamlet’s father is effectively re-enacted onstage, you are right next to them in the audience — watching Claudius squirm, watching Hamlet seethe, all while watching the play yourself. It is surprisingly easy to get lost in what surrounds you, even with a headset perched on your face. But if this technology can give people the experience of a front-row seat, will it replace live theater altogether? Maler does not think so.